Our new partnership with the FSAStore.com allows you to use your FSA/HSA savings accounts to purchase MedCline products. Click here to learn more. Please share height of user. Please share how you heard about MedCline. Thank you! The MedCline Reflux Relief System, our most popular product, includes the Advanced Positioning Wedge and the MedCline Therapeutic Body Pillow. The components work together to comfortably create (and maintain) the ideal inclined + left-side sleep position for 100% natural reflux relief. Validated in 5 independent clinical trials, MedCline has been proven to be the most effective treatment for heartburn, regurgitation, coughing, choking, nausea, and the many other distressing symptoms of acid reflux/GERD, as well as providing protection from prolonged acid exposure...all while you sleep! The MedCline Reflux Relief System takes up ½ of a queen-size bed (30” wide) and, while the left side is typically best for reflux relief, the System can be used on your left or right side. Clinically proven position for superior relief. Clinical trials performed by the top GI researchers nationwide show that sleeping in the position created only by MedCline (inclined + left side) reduces exposure to harmful stomach acid by 87% compared to a standard bed wedge. MedCline has been clinically proven to provide significant symptom reduction for patients suffering with nocturnal reflux, laryngopharyngeal reflux (LPR) or “silent reflux” patients, post-esophagectomy, and gestational reflux. You won't slide down during the night. The patented design of this dual component system creates the optimal inclined + side sleeping position for reflux relief and prevents you from sliding during the night, which is one of the primary complaints with a standard bed wedge. By not sliding down, you are able to maintain this ideal position for maximum relief, all night long. Sleep comfortably on your side. The patented arm pocket of the Advanced Positioning Wedge not only prevents you from sliding down but it takes the pressure off your downside arm and shoulder. For those who are not naturally side sleepers, the Therapeutic Body Pillow provides additional support to keep you from rolling to your back and can be pulled between the knees to take pressure off your lower back. Inclines your entire torso, not just head and neck. Unlike many standard wedges, the MedCline Reflux Relief System inclines your entire torso, not just your head and neck, for maximum ergonomic support and effectiveness. Medical-grade materials for quality, support and longevity. Most standard bed wedges are just a singular foam cut into a triangle. The Advanced Positioning Wedge is constructed with four types of medical-grade foam, strategically placed for maximum support and product longevity. The top layer of the Advanced Positioning Wedge is memory foam for added comfort. The Therapeutic Body Pillow is filled with high-quality shredded memory foam for adjustability and longevity. Plush removable and washable case installed. Both components of the Reflux Relief System come with removable cases installed, which are machine washable. MedCline is not recommended for lower back or hip injuries. MedCline creates a 15-20 degree angle so those with herniated disks, compounded disks, bulging disks, fused vertebrae, scoliosis, or lumbar damage, arthritic hips, bursitis in the hips, or hip injuries often find it difficult to tolerate the angle that MedCline creates. Looking for shoulder relief only? If you do not suffer with nighttime GERD and are looking for shoulder relief only, the MedCline LP Shoulder Relief System will work better for you. Please call one of our MedCline Sleep Specialists at 800-610-1607 with any questions. The MedCline Reflux Relief System is available in three sizes. Please select the appropriate size based on your height as comfort and effectiveness are dependent on a proper fit with your torso. Should you have any questions about which size to order, please give us a call at 800-610-1607. An investment for my health. I purchased this pillow for acid reflux. and severe shoulder pain. I know we are different, but this pillow worked for me. I sleep so much better. The cost for me is an investment for my health. I don't even care that I cannot dress my bed like I used to. My only regret is not getting it sooner. I said the same thing. My wife bought it for me. It is worth way more than they are asking. My only regret is not getting it sooner. I wake up with no shoulder pain, I sleep without choking on acid. My snoring has almost went away. I sleep so much better. I love mine. I can't get a good night sleep without it. I have reflux & shoulder & neck issues. This pillow has helped a lot with all 3 issues. I know it is pricey but it is good quality. I bought both the wedge and body pillow. Tried both at first. Had to take the wedge off the bed for the first week or so. Got used to the body pillow, just added the wedge back last night and slept so comfortably!!! I didn't want to get out of bed this morning!!! Best investment I've made in a long time. I've been using the MedCline for 2+ months now. It has eliminated my reflux issues, reduced my shoulder pain issue and my wife claims I'm no longer snoring. It takes a little more effort to switch positions (left side to right and back again) but that's a small price in light of the upsides. I'm extremely happy with the MedCline purchase and enthusiastically recommend it to those who may be experiencing some of the issues it's engineered to alleviate! Five starts for quality, five stars for service. We bought this and it is a well made, quality product. Like any pillow, even a great product won't work for everyone, because not everyone is built the same. The company was wonderful to deal with in the return process. Five starts for quality, five stars for service. Any friends that deal with GERDs (Heartburn) please read. I have suffered for years, take prescription medicine and it got to the point i was taking my prescription medicine in the morning, over the counter medicine in the evenings and waking in the middle of the night to take baking soda and water. I recently purchased a MedCline pillow and it works. Zero heartburn. I still take my prescription meds but going to stop taking those in the next week or two. The pillow is expensive but worth every penny. It also helps with shoulder pain from sleeping on your side. I absolutely give it 5+ stars!! My reflux and shoulder pain are no longer since I received mine in December 2018. It did take a few nights with trying different placement of pillows, but I absolutely give it 5+ stars!! I no longer toss and turn from side to side. Best sleep I’ve had in years! I'm glad I found it. I'm glad I found it. I was just so sick of being woken up at night from reflux, and at a very extreme level. I'd wake up coughing and choking from it. Your device saved my life. As an secondary side effect it has caused my snoring to go away! Bonus! All I can say is thank you, thank you!! I love this! I have not slept this good for a long time! After spending a lot of $$$ for so called good pillows, I have to say this was money well spent!! Not only has my acid reflux subsided, I now wake up with no shoulder or neck pain. I highly recommend it! All I can say is thank you, thank you!! I now sleep thru the night! It took me many months to talk myself into paying this much for a pillow but its worth every penny. I had arm pain in both arms, up many times a night. I have acid reflux and Meneire's disease. I now sleep thru the night. No pain in my arms, no reflux and I can sleep on my back again. It did take getting used to the pillow but once you do its a life changer. Oh and my dog loves the snake pillow on top! The Medcline system has been a game changer for me. I not only have acid reflux, but I have also had a severe shoulder injury. Both issues have improved since I got my Medcline. I was constantly in need of trigger point injections to relieve muscle spasms, from putting weight on my shoulder while lying on my side. Since I got my Medcline, the instances of needing those injections has decreased dramatically, and my need for nighttime antacids has been eliminated. I have had my Medcline for nearly a year. The outer fabric is soft and hasn't pilled at all when washed and hung to dry. I hate having to sleep without it and have recommended it to several people I know! I did not want to pay the price and it took me 2-3 weeks to get use to it. But now I love it and have not have had reflux one time and sleep better due to my sleep apnea. I think now it is worth the money. I was hesitant to purchase one because of the price, but finally did 3 months ago and I'm so thankful I did. This is a 3 piece pillow set and for the quality and material, it is worth it as long as you get the 40% off deal, for certain. I have paid close to $200 for king size Tempurpedic pillows that are nowhere near as great as this pillow set, so the extra money is worth it. I have minor acid reflux issues, but my biggest issue was rotator cuff pain and this completely eliminates that for me, plus destroys any nighttime stomach issues for me as well. On top of that, the body pillow is very unique and gives me the exact neck support I need leaving me with an all around better quality sleep. When this pillow set up is all in place, and I lay down, I feel so comforted and cozy, I really love it. Only downside is, is that because of the size it is super hard to fly with and I travel a lot so typically cannot take it with me, and on my last trip I had a bad rotator cuff flare up while sleeping at a hotel that I didn't have my pillow set with me for. Can sleep through the night without waking up suddenly from acid reflux. Best investment I ever made, Can sleep through the night without waking up suddenly from acid reflux. I never go without mine. It is a hand full when traveling. WATCH THE VIDEOS. They helped so much! I’ve had mine for about 6 weeks. Struggled with positioning at first. WATCH THE VIDEOS. They helped so much! Am now loving it and it has helped tremendously with the acid reflux AND my shoulder issues. It’s well worth the money! I recently had rotator cuff surgery and since then sleeping on that shoulder which is the side I sleep the best on was waking me up hurting. I’ve also had acid reflux wake me up in the middle of the night a few times every week. Since I purchased the MedCline pillow it took me a couple of nights to get use to it but some then I have slept way better and the shoulder pain and acid reflux is gone. My wife also says that my snoring isn’t as loud and she also glad I bought it. I highly prefer this pillow! It’s well worth the money! I have spent hundreds upon hundreds of dollars over the years trying to find the perfect pillow which will help me get a decent night's sleep.I cannot lie flat anymore because of acid reflux problems and I cannot prop up comfortably because of breaking my back a few years ago. it has been a constant battle to find a position of comfort. my daughter bought this pillow for me to try about 7 months ago, after I got through the" getting used to it" stage, I can honestly say this is the best pillow I have ever slept on in my life. it is the perfect height to prevent acid reflux but not too high as to cause back pain. words cannot describe how grateful I am for this product. I would never consider sleeping on another pillow again. it is worth every dime that this pillow cost to purchase. I do not work for this company , I have no benefit in telling you great things about it other than the fact that I'm trying to help someone else discover what an incredible night sleep this pillow truly brings. Once you get used to sleeping on it, you will swear it is the best thing you've ever had. it holds its shape and you can move around at night with ease and without fighting with repositioning the pillow. I'm just posting here for others who may be searching for that perfect pillow, and to tell you that with the MedCline pillow, I have found the perfect pillow. thank you MedCline for creating such an amazing product. It does work and awesome customer service dept. to boot. I bought one of these with my HSA, and have to say it was one of the better purchases I've made for my health. I had a Nissen Fundoplication many moons ago, and the procedure never really prevented reflux the way it was supposed to. Thankfully though, this has. I love my MedCline!! I have had reflux and shoulder issues for many years, but since I’ve had this pillow system, my shoulder pain is gone, and my reflux symptoms dramatically reduced. It was worth every penny! My girlfriend jokingly calls my MedCline my 'cheese wedge and snake'....LOL But I sleep like a baby now and have not had one episode of that dreaded midnight 'acid reflux' since purchase. Thank you. I no longer suffer with night time reflux! I have suffered with reflux for years. I was reluctant to spend the money on this product but finally decided to try it. It was the right decision. I no longer suffer with night time reflux and have gotten rid of the extra pillows I used to prop up my head which only gave me a stiff neck. I love the way the incline supports my torso. It gives me a comfortable and sound nights sleep. Thank you MedCline. This pillow is a miracle for me! I had terrible reflux while I slept (waking up choking sometimes). This pillow is a miracle for me. No more waking up choking. I’m also a side sleeper and the pillow has relieved the arm numbness I would get. Worth every single penny. It works! Plain & simple. After waking up every night between 2am-4am and taking antacids, who new my solution would be a pillow. I have had the MedCline pillow over a month. Not once have I had to take ANY antacids. The relief it has brought me is awesome! No more sleepless nights. Even during the day I have noticed LESS indigestion. After years! of suffering, I feel normal again. I have zero reflux since using this. It is extremely comfortable and well worth the money. I was at a complete loss with my acid issue and about to have the magnetic ring put around my esophagus. I'd wake up choking to death on my acid. then I saw the add for Medcline and I decided to give it a try. from the first night I tried it til now.....I have NOT choked at night. I have no acid issues at night. MedCline is totally worth the money. it saved me $25K with not going thru with that magnetic ring. I like to think MedCline saved my life. I highly recommend this pillow! As of today, February 10,2019, I’ve had my MedCline Reflux Relief System 17 days. My reflux problems have all but gone and the quality of my sleep has improved 100%. I was very skeptical about purchasing. However, the 100 night money back guarantee convinced me to try it out. There is no way mine will be returned. The shipment was extremely fast. I ordered my system on January 19, 2019. My system was shipped on January 21st and I received it on January 24th. I hope that this system helps others as much as it has helped me. Thank you so much MedCline for this amazing system. Definitely 5 stars! I have issues with reflux/regurgitation and wake up daily with mucus in my nose/throat even if I’ve taken my meds. The ENT said this mucus is caused because my reflux is happening all night and my body produces mucus to coat and protect my throat. Every morning I wake up hacking because I can’t get the mucus out and my stomach is filled with “spit bubbles” and I feel bloated. It takes everything in me not to vomit every morning to get the bubbles out of my stomach. After using MedCline, four nights in and for four mornings I haven’t felt snotty or the need to vomit. It’s a wonderful feeling to wake up and be ready for the day instead of trying to get over the feeling of being sick. I have had two nights sleep with it so far. I originally was looking at it for shoulder pain I started getting 2-3 weeks ago, that seemed really bad after sleeping, but better during the day. I am a side sleeper, so I figured it is the fact that I am putting that pressure on my shoulder. Once the pillow arrived, I was able to side sleep again without the increased pain I was feeling every morning. I also have acid reflux and snore. My wife says she hasn't heard me snore, and I haven't needed a nightly Zantac. As with any drastic change in sleep, I'm sure it will take me some time to get used to the change and the sleep will only get better. With their only being a $20 difference to include the body pillow, I would suggest doing so. It is well worth the difference. Per the guidelines on the website, I ordered a large in Nov 2018. After trying it, it just didn't work well for me. It was very uncomfortable and caused back and hip pain. I called customer service and they were happy to let me return the item. As part of that conversation, she asked if I was interested in trying a medium, as that might be a better fit. I said that I would be interested. I returned the large and received a medium at no charge to me. The medium was a better fit, but I still ended up with the same problems. I am clearly in that group of people for which the Medcline wedgie pillow does not work. I called today and arranged to return the medium, but opted to keep the body pillow which I did find to be helpful. So why 5 stars? Customer service. I was disappointed that the Medcline wedgie didn't work for me, but was very pleased with customer service. Very pleased. My husband loves it worth the investment! I look forward to going to bed now. This has been the best investment I have ever made!! I had acid reflux for over 10 years to the point I vomited on a nightly basis no matter what I ate or when. I eroded my esophagus badly. I was on medication to help heal it but nothing helped until I got MedCline pillow. I have been able to sleep soundly without any reflux. I look forward to going to bed now. I haven't woke up once since I began using it! I'm a skeptic about everything... If something sounds too good to be true, it usually is. Needless to say I didn't have high hopes when I ordered my MedCline Reflux Relief System. I've now had it for several weeks now and I have to say I have NEVER slept better! I used to wake up 2-3 times a week choking on stomach acid...If you've ever experienced this you know how scary it can be. It got so bad I stopped sleeping in our bed altogether and began sleeping on the couch so I could maintain an upright position. The MedCline Reflux Relief System is really paying off! I haven't woke up once since I began using it! I get a full night's sleep and wake up feeling better than I have in years. The body pillow is a must! I can't imagine using the Wedge without it. The quality is terrific and I'm glad I took a chance and ordered it. My sleep has improved so much! My wife gave me this pillow system on my birthday a month ago. I'm so glad she got it for me, my sleep has improved so much and my night GERD is under control. I know it is not cheap, but for me it was worth the price. This is one of the best things I've ever invested in. My primary sleep problems were acid reflux at night, tossing and turning, and whenever I slept deeply I would sleep on my arm awkwardly and create numbness in my fingers that would last for days. This pillow seemed like it could solve all of that because of the wedge aspect and how it keeps you elevated *above* your arm so your weight isn't on it. So I bought this pillow thinking to myself okay. There's a 100 day return policy. If I don't like it, I can return it. But if it works, then is finally getting good sleep after actual years of terrible sleep worth the cost? It was uncomfortable at first. Weird. And when it comes out of the box there's a smell that takes a little while to dissipate (a few days in my case). The people who sell the pillow know this so they suggest airing it out for a while and they also encourage you to give it a few nights because it can feel strange at first. Around day three, I finally caught on to how I sleep best with this pillow and it's been bliss ever since. I've gotten better sleep since I got this pillow than I have in a very long time, and I haven't had the awkward sleep numbness either. I don't wake up with acid reflux anymore. And it comes with this sort of J-shaped body pillow that goes part and parcel with the wedge and it's hard to describe how amazing this thing is. In retrospect, someone mentioned that I might have in some way been able to get insurance to cover this. I was desperate at the time because things had gotten so bad that I was only sleeping 3-4 hours each night. So if you think this pillow might help you, consider insurance to help defray the cost. This is one of the best things I've ever invested in. My husband has been a snorer his whole life. It has caused us to sleep in separate rooms during allergy season and has left him feeling forever tired in the morning. I bought him this pillow on a desperate whim for Father's Day and I haven't heard a peep out of him since!!!! FINALLY!!! Took him about 2 weeks to really settle in to it and find his favorite positions on the pillow but he's got it figured out and we've both never slept better!! Thank you!! This works! I can’t remember the last time I slept through the night without acid reflux and coughing spells. I slept soundly the very first night and every night after that! I highly recommend for people who suffer from this or other ailments that you need to prop a million pillows for! I am in love with this. My husband has GERD and shoulder and neck pain. He has had Physical Therapy, etc. and faithfully does the exercises they gave him. Still his pain was starting to keep him from playing many of his musical instruments. He has been a professional for 50 years, so it was heartbreaking. We ordered the pillow as a last resort. I am happy to say he is sleeping much better and hasn't been up with reflux since. His pain has diminished and his spirits are definitely much higher. He is able to play his guitars again with a small adjustment in instruments. People so often give up on us "old people". Let me say we are very much alive and deserve to live as comfortable and happy as anyone. This pillow has been a great help. It's been a miracle purchase for me! I have come close to choking to death from acid reflux in the middle of the night more than once. Tried all kinds of pillows, sleeping on my left side even tho i need to switch sides because of arthritis and since i bought this pillow 4 months ago I haven't had one incident of acid reflux. It's been a miracle purchase for me. I finally took the plunge and purchased this thing on sale and I'm SO glad I did! I have not had shoulder pain, lower back pain, headaches or heartburn in 2 weeks! All of my nighttime aches and pains went away when I started using this pillow. I used to wake up every hour or so and now I only wake up maybe twice a night, at most. The body pillow alone just hugs your body and cradles you while you get into an elevated fetal position (LOL I've found that's the most soothing & comfortable for me). Well worth the price for a great night's sleep. I'm more alert at work, feel more accomplished because I'm less fatigued, and my mood has overall improved. Sleep, people! It's life-changing! Best sleep we’ve had in years! This pillow system has been life changing for my husband who had esophageal cancer and had his esophagus removed and has to sleep elevated. I got it for my chronic arthritis throughout my body. Best sleep we’ve had in years! I use the long pillow sometimes, but sometimes I don't depending on my mood. I keep it next to the bed so I can grab it and add it in the middle of the night if I wish. It gets in my way as I move around at night sometimes. I also have to prop up my head more with my own pillow. But the wedge is just the right height to alleviate my acid reflux and choking attacks in the middle of the night, and I do LOVE the holes where I can put my arm when I turn to my side. Genius design! It is a bit pricey, but I like it and am glad I invested in better sleep. I've been sleeping with it now for over a week, and I love it. The long snake pillow and the wedge pillow both have zippers so you can take off the covers and throw them in the washer. I'm impressed! I love mine! It will cradle you in comfort. Also, works to stop my snoring and heartburn. Sleeping straight through the night now. I am one who was never able to sleep more than 3 hours a night now I get 6-8 hours easily. The funny thing is i bought this pillow for acid reflux and not only has that improved but my back, shoulder and neck doesn’t hurt When I wake up. Paid $240 on my HSA. Great pillow. Expensive but well worth the price. Wouldn’t hesitate to recommend and would buy it again without hesitation!!! I'm still very pleased with this wedge and pillow combination. My acid reflux is very well controlled using this combination. It's also been very good for my back, neck, and shoulders. I don't always put my arm out under the carve out in the wedge, but just being able to lower my elbow below my shoulder helps. There are two drawbacks and I deal with them. One is that the system takes up a LOT of room on our queen size bed. The second is that it takes a great deal of wrestling to take the covers off and then put them back on after washing. For me, the benefits outweigh the drawbacks. My best purchase ever. Finally able to sleep without being woken up by feeling like my stomach is on fire. I just wish they invented this 30 years ago. Such a difference when you can actually sleep through the night. It’s very comfortable too. I’ve been recommending it to everyone I know as it really has been a game changer for me. I've owned mine for 5 months. I absolutely cannot live without it. It has changed my life. Well worth the money. I love this pillow. It gives me just enough of an incline for my reflux and my arms no longer go to sleep from the pressure of putting my arm under my pillow. I love the cut out for my arm and can use it if I'm sleeping on my left or right side. It is so worth it. I'm gonna miss it when I go on my cruise, cuz it won't fit in my suitcase. �thank you MedCline. MedCline makes the whole day better. I’ve had my wedge & body pillow for a few months now. I was so frustrated with not being able to sleep well because of my gerd (which no diet change or medicine seemed to help) & shoulder/neck pain. This system has been so worth the money for me. I’ve never felt so comfortable throughout the night. Waking up without shoulder and neck pain has been such a relief. It makes the whole day better. I’d highly recommend this for anyone who has neck/shoulder issues and/or suffers with gerd. Also, there’s a risk-free trial period, so if it doesn’t work for you, just return it. I figured I’d be one of the people returning it. No way. It’s been life-changing. Worth the money! Thanks MedCline. Bought by husband one too! I have shoulder problems and bought this pillow for that reason. It lets me drop my shoulder down and stop the pinching. It's been amazing for this and has stopped my hands from going to sleep all the time! My husband snores and has acid reflux I bought him w second pillow. It's helped tremendously with this. He says it's the most comfortable pillow he's ever had. If you're questioning whether the price tag is worth it, I will say this: I've had mine about a month. That works out to $10 per day I've paid to use it. I've never slept better. I am a side sleeper, I also have GERD, sleep apnea, lower back, and shoulder issues. These things have been alleviated a great deal since purchasing Medcline. Now my fiance wants one of his own. For something you use so frequently, it's well worth the investment. This pillow went a long way to helping the Barretts heal! I actually purchased this and it's worth every penny. I've had it for almost three years now and it's very high quality. You can purchase just the incline pillow for less than the $300 price but the 'candycane' body pillow is worth the splurge. I have GERD. I had Barretts. This pillow went a long way to helping the Barretts heal and not show or present at my last endoscopy. Its actually very comfortable to sleep on which is not easy to say about sleeping on a wedge, and i have tried them all. You get what you pay for and this is a medical expense you can probably pay for with a flex spending account if that makes it easier on the price point. Best purchase decision i have made in a long time! Worth. The. Price!! I have had the MedCline for two weeks now. It is wonderful. It has solved so many of my sleep problems, i.e., snoring, neck pain, arm pain, shoulder pain, and acid reflux while sleeping! It is very well made and does exactly what it is supposed to do. It keeps me in the position that I need to be in to solve all of my problems. The way it is made not only keeps you in the position you need to be in but, it takes all the pressure off of your arms, shoulders and neck while laying on your side. It keeps me at an incline that stops my snoring and keeps the acid down. MedCline's customer service is impeccable as well. They are there for anything you need and make sure you are settled in with your new MedCline. I was very pleasantly surprised by their customer service. It is not at all like today's businesses. They truly care! I have one and it's great! I have one and it's great! I have a lot of shoulder pain and this has helped immensely. I also have nearly eliminated acid issues at night. It's better during the day as well (not sure if its a coincidence). I'm beyond happy with my purchase and recommend it to anyone. I’ve had mine for a week and so far so good. It here is an adjustment period but I am enjoying the pillow. Really helps with my GERD. I’ve had this pillow for several months now and it’s very good. Super comfortable and really helps with my GERD. 5 estrellas se lo merece. Para Mi, es de lo Mejor y solo llevo tres dias con mi MedCline, Me encanda como se amoldea en el cuerpo para brindarte la comodidad que buscas para descansar. 5 estrellas se lo merece. Had a problem adjusting to this new pillow and, after talking with Danielle, she offered to send out a different size at no cost so I could see if that resolved the issue. The professionalism and level of customer service I received from this company was outstanding! I ordered the pillow due to a painful shoulder first and foremost. Then I read it helps with acid reflux, then it said is helpful with Apnea. Wow, all my issues in one product. I ordered the pillow and the long round pillow as well, figured might as well get the whole deal and see if it works. Was hard to get used to especially the first week. The company sent me a video and that helped, had to watch it a couple times. They emailed me a couple times asking if I needed any help or questions. I'm just about 3 wks into it and love it. It's so comfortable. First night my shoulder didn't hurt and still doesn't. Have gone 2 wks without cpap and zero acid reflux! It is bulky on the bed so I can't make my bed look nice in the morning. I don't toss and turn all night, many times I wake up in the same position I went to sleep in. It's like sleeping on a firm marshmallow. I'm so happy with my purchase. I can honestly say from my fist night sleeping on the pillow with the body pillow I have not had any acid reflux. Last night I had can tomatoes in a dish I made and normally I have acid reflux last night I didn't. I'm so happy with my purchase. Also I might add it is not cheaply made. Thank you MedCline! Seriously, this company cares about its customers. What an amazing product. After years of suffering from nighttime acid reflux and waking up every morning with horrible shoulder pains, I've had a good night sleep and a pain free start to my day. This pillow is the ultimate in sleep comfort. The body pillow is so soft and inviting, I have to pry myself away from it in the morning. I did have a slight learning curve to sleep on an incline, but waking up feeling refreshed made it all worthwhile. If you suffer from acid reflux, or have horrible shoulder pains because you are a side sleeper, you need this pillow. My HSA even paid for it. Don't hesitate. Why deny yourself a better night sleep. While I did experience a problem with a chemical smell coming from the pillow, after speaking with MedCline's amazing customer service department on the phone I felt assured it would dissipate quickly. They even told me to try walking on it to help degas it quicker. Seriously, this company cares about its customers. They went above and beyond during my phone call to make sure I felt not only like a priority customer, but like a human, something lost on so many businesses today. I can't thank them enough for providing me with a good night sleep. This pillow changed my life! Many years ago, I was stricken with esophageal achalasia, a somewhat rare illness for a child. The surgical procedure used to repair the problem (Heller Procedure - twice) left me quite vulnerable to a lifetime of reflux issues. In the 50 years since my symptoms began, I have never found the exact "cocktail" of remedy. Sleeping sitting up, incline beds, adjustable mattresses, wedges, antacids, blockers, you name it-I've tried it. I'd sleep standing, if it meant a quiet stomach. Then I discovered Medcline. This wedge is a game-changer, and has literally changed my life. I can sleep more soundly knowing that if nighttime reflux occurs, my natural Medcline pillow will provide immediate and lasting relief. Knowing how effective it is, reduces the stress that likely generates the reflux in the first place. Within about 30 seconds of positioning myself, the symptoms begin to abate , the body relaxes, and the discomfort vanishes. Literally..this invention is a miracle to me. Without exaggeration or hesitation, this pillow changed my life.Thank you for inventing it!!! My search for the perfect side-sleeper pillow has finally ended (no thanks to you, Amazon...really?!). As I enter my 40's, I'm noticing more and more shoulder discomfort in addition to frequent tossing and turning at night. More recently in the past six months, I've had to deal with torn rotator cuffs on both shoulders (no idea even how these occurred) which prompted me to aggressively search for a "body pillow" of any kind that would alleviate weight on my painful shoulders being that I'm a stomach and side-sleeper. Searching Amazon resulted in nothing (very disappointing to say the least) and I had pretty much given up hope (other than cramming pillows under my armpit with only marginal effect). Then I ran across a Facebook ad for MedCline's pillow and after carefully scrutinizing their website, I figured the $200 they were asking for would be worth it only so long as it brought me my much sought-after relief...and it did...in spades. More people need to know that this pillow exists. Whether you've got shoulder pain, acid-reflux or simply don't want to wake up every couple hours due to arm numbness from cutting off blood-circulation (all you stomach and side-sleepers, you know what I'm talking about! )...this is THE pillow you want (and in some cases like me, maybe didn't even realize exists). I'm 5'8" with 28" pant legs and I've found that the medium-sized MedCline pillow works very well for me. It gives me enough height support around my armpit that there is no blood-circulation cut-off anymore! And it's wickedly comfortable, too! This might sound corny, but I honestly can't imagine sleeping WITHOUT this pillow for...the rest of my life, no joke. Getting older isn't fun but at least I won't be losing sleep and I'm so glad that someone invented this amazing pillow. Kinda funny that I'm writing a rave review over a pillow but...try it (even if you don't have acid-reflux issues but are merely a side-sleeper). I'm pretty damn sure you'll be impressed. Thank you, MedCline!!! I’ve been using this pillow system since last summer about 5 months now. One of the first things I noticed was I sleep better more sound. Secondly I don’t wake up in the middle of the night anymore and I know it’s the pillow. My wife washed the pillow cases one day and I had to go back to the old flat pillow and sure enough I woke up in the middle of the night for a potty break. Thirdly my arthritic shoulder feels much better sleeping on the medcline pillow system. And finally no acid reflux issues after eating something spicy like I had with the flat pillow. All in all have been very happy with the Medcline pillow system and I recommend it to anyone especially if you wake up all hours of the night going to the bathroom. I am very happy with this product but it does take a few nights getting used to the wedge and body pillow but it well worth the trouble. This has been a life saver. My husband got me this pillow for Christmas. I had nights before that I was scared to go to sleep because the attacks could be so bad. Since I got the pillow I have not had one attack. In fact the one night we went out and I stayed in a different bed with out it I had a bad attack. The doctor is watching me and checking to see how this pillow is helping he is planning on reducing my meds now also, he wants to recommend it to others after we review my process. I truly can't sleep without it. In fact we are going on a cruise and we are trying to find a way to compact it for travel. Next step travel packing add on would be great. This has been a life saver. So much more than a "fancy wedge pillow"
Excellent product! Great customer service! Answered all of my questions on the phone and made me feel excited about trying the system. As soon as I got it on the bed and felt how comfortable it was I knew that a lot of intelligence, care and engineering went into this product. It feels like quality and it's so much more than a "fancy wedge pillow". After a week of use, I wake up comfortably in the same position I went to sleep, with no acid taste in my mouth, and it's hard to leave the comfort of the full body pillow in the morning! Highly, highly recommended! I have been using this pillow system since December and I can say this is well worth the money! I purchased it on Black Friday and used my HSA. It took a few nights to get into the right groove, but from night one my nightly acid reflux attacks stopped. I have had two lower back surgeries, so I was concerned about the positioning, but the U pillow fits comfortably between my knees and I have not experienced and low back or hip pain from sleeping on the incline. I do toss and turn during the night and find that I occasionally slip down the pillow, but after a quick re-adjust I am always able to find a comfortable position. This pillow system really has been exactly what I was looking for and can't imagine sleeping with regular pillows again. My one complaint would be I wish the cases came in different colors. These are fantastic!. My wife spent two weeks at National Jewish Hospital in Denver for complications with her Alpha-1 Antitrypsin Deficiency. While at National Jewish she learned she had lost an entire lower lobe of her left lung due to silent reflux gurd. The Dr's explained the importance of diet and suggested she alter the way she slept by using some sort of elevated bed. The prices of adjustable beds are incredibly high. A Respiratory Tech mentioned the Medcline but said she didn't know anyone that had used one. I looked them up and thought it was a lot cheaper than any of the other options so I ordered one. It arrived at our front door in Idaho before we even made it home. I made the mistake of ordering a large pillow thinking that my wife has long legs and is not on the short side. She complained that it hurt her hips. After a couple of days I called Customer Support at Medcline and they said she needed the MEDIUM which they shipped us a replacement unit at NO COST! That was the frosting on the cake! I began using the large pillow, I'm 6'1" and the large fit me great. I don't have GURD but I do snore, a little. my wife will say it's a lot. I love the pillows. I can't sleep on my back but these pillows are great. I'm getting the best sleep of my life. I can sleep on my side and tummy too by placing my face in the opening for your arm. We take these with us in our RV too. I highly recommend this product. I bought this for my shoulder pain. But my husband’s snoring was so terrible- I encouraged him to try it- it totally stopped the snoring! I am delighted and only used it once myself! Will be getting another for me! Love, love, love my medcline pillow!!! This has been the only thing that has relieved my shoulder pain! After getting used to it, which only took me a few nights, my shoulder pain resolved in about a week! I no longer wake up because of pain! Not to mention curbing my occasional GERD! Thank you for this wonderful pillow and great nights of sleep again! I cried the 1st time I woke up after using it! I just so happen to be one of those people who found instant relief of both my shoulder pain and especially my silent reflux. I've had the MedCline pillow for 4 days now and it has been the best 4 nights of sleep I've had in YEARS. I cried the 1st time I woke up after using it, finally I woke up with no acid/acid taste in my mouth. I'm 37yrs old and my silent reflux is so bad it is eating my teeth and I'm gonna be given dentures soon...the MedCline system makes me feel so much better because I know the acid hopefully won't hurt my teeth anymore, especially when I sleep and to me that is one of the best feelings in the world. Plus just having a great nights sleep is just awesome sauce especially when u have a special needs child. Thank you so much!! This is the best pillow system!! It not only helps with my acid reflux, it also keeps me from snoring and I wake up less often with numbness in my arm from sleeping on it wrong. Easy to purchase online with my HSA and it was delivered within a week of ordering! I have had many a good night's sleep since purchasing this and recommend it! Helped me with my snoring so now I get kicked out of bed less. I think it would help me more if the angle was slightly less. But I'm happy with it. The body pillow is the best part. No more reflux waking me up all night! I have one of these and I love it! No more reflux waking me up all night. Totally worth the money!! I took a chance on this based on my uncles raving about this pillow for his acid reflux that looked like it could help my husband and his shoulder pain. My husband has not slept in 26 years a full night because of his insomnia and his shoulder pain. He has a torn labrem and super spinadous. He has slept so much better that I am even getting a good night sleep. My husband loves this pillow so much that he dragged it back and forth the whole summer to our vacation home. Take a chance on this pillow it might do wonders for you. In addition, the customer service is amazing, responsive and will answer all of your questions. If you are thinking about this pillow, don't wait. I don’t even like to leave it while I’m gone to work! I am a disabled veteran with a whole series of health issues, MedCline products are by far the best and only system I have found any relief from. MedCline has helped ease my Severe Chronic Pain while also relieving difficulties from problems such as Ehlor's Danlos, Arthritis, Fibermyalgia, Severe Carpal Tunnel, Severe Restless Leg Syndrome, Large Hiatal Hernia, Swallowing problems, etc., as well as help me sleep for longer periods of time. I would recommend MedCline to anyone looking for relief and a better night sleep. Thanks MedCline! Thanks MedCline for a terrific product! I want to start off by saying I was not paid or reimbursed for my statements. These are my views and statements for the MedCline advanced positioning wedge and body pillow. The wedge and body pillow have been a blessing. I am a side sleeper and GERD sufferer. I often wake up with sore shoulders and arms that are asleep. But I can tell you those days are behind me. I've been using the wedge/pillow for only a few nights but I have slept through the night the past 4 nights. No problem no flare ups of my GERD no shoulder pain nothing. I know the price seems steep but the MedCline has been a life saver and finally lets me sleep through the night. I love it and will be keeping it. Thanks MedCline for a terrific product! Can’t sleep with out it! I have been using this pillow for the past 4-5 months, all I can say is I luv it and can’t sleep with out it. I had surgery to correct a problem called Achalasia, back in 2011. Since that time, I had to sleep almost completely upright, in my recliner, almost constantly. The sphincter muscle between the stomach and esophagus is open constantly now, so bile and acid always regurgitate. 4 months ago, I found the Medcline system and moved back onto my bed. The only thing is, I have to use it ALL NIGHT LONG. It has given me back, the sleep and painless nights, that I had before I had my surgery. Best $300 I have spent in a long time. I only wish they made a travel model that is not so cumbersome like this one. This product has got me back into my own bedroom. If my wife needed rest, often as not I would find myself on the couch with terrible sleep and waking up in the morning. My snoring was so bad, and I am out of average weight. I have tried snoring surgery, these plastic inserts in the back of my throat, and the ridiculous snoring spray that desperate folks like me would try, but nothing worked, however,my wife always said if I sleep on my side, that my snoring would decrease. I wasn’t really happy about spending just under $300 for a pillow, but my wife said that after spending $1400 on one surgery and about $3000 on another surgery, what was another $250? Since they had a guarantee, I thought, what can I lose? I’m happy to say that my wife says that I snore so little that it doesn’t even wake her up anymore, and strangely enough, I sleep through the night now. Something that I haven’t done in years. I absolutely love my medcline, Has helped with acid reflux as well as issues with laying on my left arm at night. Planning on getting one for my husband for Xmas. Since I've been using this, I no longer have reflux at night, it has helped with my snoring and has also relieved shoulder pain. Worth every penny!! Due to the severity of my reflux my insurance paid for it. I had seen this product on a FB ad and bought it directly through the medicline website. I suffer from tendinitis in my shoulders which can worsen if I sleep on my side the wrong way. Was able to purchase this medical device using HSA funds and have been enjoying it very much! The incline and body pillow make it so easy to get comfortable and fall asleep...and just as importantly for me, fall back asleep when i wake up in the middle of the night. It’s a great product and highly recommend it for anyone even if they don’t have a medical condition. The MedCline wedge and body pillow work superbly to address my acid reflux condition. The incline is comfortable and works great for television viewing. The texture and feel of the MedCline material provide a luxurious experience for sleep. I would recommend it. I was having sore stiff shoulders waking in the morning. This pillow helped a lot! The MedCline pillow has definitely brought a new level of comfort and sleep to this fibromyalgia sufferer. I also underwent a back surgery recently and the wedge pillow has made my nights much more bearable during my recovery! I would definitely recommend! I bought the MecCline system almost a year directly through their website. I do not have acid reflux but have trouble sleeping through the night in bed. I normally wake up with a sore shoulder, sore hip and lower back pain. from sleeping on my side and then have to move to a recliner for the rest of the evening. I am 5' 3" but am heavy so I ordered the large and am glad that I did. I love this pillow and show it to everyone who comes to our home. I have traveled quite a bit this year and even thought the pillow is quite large I take it with me whenever I travel and am able to sleep wherever I am because I have it with me. The pillow is large and heavy so it definitely takes up quite a bit of room but luckily my husband and I have a king size bed. We have also used it in a queen size bed and it takes up a little over half the bed. My husband does have acid reflux and there are a few nights he has asked to use it and likes it as well and says it helps. Even though I am heavy the wedge and body pillow have held up over the last year. Would highly recommend this product to anyone that is a side sleeper and has sleeping issues. I have been using this pillow for just a couple of weeks now, but I absolutely love it! I have been taking medicine for reflux for many years - twice what is normally prescribed. After just one week with this pillow, I have cut my prescription down to every other day and I am not having a problem. I am sleeping better, also. This is absolutely a very valuable product! I been having back and shoulder pain for over year now. I have tried every pillow you can think of, I was about purchase a new mattress to try to fix the problem. I thought I would give Med Cline a try. It took a couple days to get use to it, but it works no pain. Also my wife said I stopped snoring. So I am going to purchase one for my wife. I do not normally do reviews, but it actually works. I have used my MedCline now for about a month, at first I thought I would have to send it back but kept on using it and all of a sudden one night I slept very well, I also use a BiPap machine so with the two I together it was kind of a challenge. I can now sleep on my side again with two bad shoulders, and it is helping with my gerd problem very well. I’m so happy with it and don’t know if I could sleep without the MedCline, So thank you so very much! I many times have had gastric reflux and have many times jumped out of bed rushing for any available sink. My physician recommended placing books under the head of the bed footing for elevation. Though his recommendation probably would have been a simple fix, I did not do it. Anyway, as I was browsing through one of my social media applications, I stumbled upon MedCline and immediately tapped on the advertisement which lead me to the company website. I was very impressed with the information provided and began to do a little research online to see other products comparable to theirs. Nothing kept my attention. So I just had to order this MedCline, and I am glad I did! I was also happy to see that MedCline accepts Flexible Spending Account's as form of payment. My experience with the advanced positioning wedge and theraputic body pillow is beyond amazing. Though at first finding it a bit odd to use, the body pillow really made it easy to position myself comfortably. I have not experienced any reflux since using this product and recommended it to one of my colleagues who's wife suffers from GERD. As I was showing him the product online he was pleased to see that "one size does not fit all". Yes, the advanced positioning wedge are sized based on height. I am a pleased customer and recommend this product. Oh and my Yorkshire Terrier is a big fan of the body pillow too! I have horrible post nasal drip and some shoulder/neck pain from sleeping on multiple pillows. I have had this system with the body pillow for about 3 weeks and have had the best, most comfortable sleep in over a decade. It's really unbelievable as I have been miserably sleep deprived for years, to say nothing of the neck pain. I have suffered from LPR for the last 2 years. Sleeping at night became quite a task and I could never find a comfortable position. I read about the MedCline pillow and thought I'd give it a try. After all, if the studies on the pillow were supported by the Cleveland Clinic it must to be worth something. I have now had my MedCline for approximately 8 weeks and it is really working!! I must admit that it takes some time getting used to it and you definitely need to tuck your arm underneath it to ensure you don't slide down during the night, but I am happy to say I am getting a great deal of quality sleep now and feel so much more rested when I awake in the morning. Make sure you sleep on your left side as recommended, it has certainly produced the best results for me so far. Bottom line, it works! This Pillow was the best you can buy, I have Cancer and this has helped me sleep and get rid of Fatigue, it is so comfortable, helps with lymphedema and good rest. I suggested to my best friend, Jodi, and she used mine at a stamp retreat one night and the next morning we ordered her one. I love that I was able to buy an extra pillow cover to wash the other one and be able to cover my pillow right away. You will never get the quality from any other Pillow or covering. I am very happy I got the MedCline bolster with U-pillow. My shoulders normally ache all night and all day. The pain is much better now. I used to wish I could dig out a hole in my mattress for my shoulder to fit into. I also have acid reflux which this is helping. For me, the U-pillow is very helpful as it keeps the pillow under my neck and it is just the right size. Plus, I put the long end of the pillow between my knees and it helps my back. I also love the soft fabric on the pillow. Very happy with my purchase. I have GERD and take meds In the AM and PM. Before I got this I had stomach pains during the night and during the day. Almost immediately I noticed the stomach pains went away. I don’t take my night time meds anymore - working on getting rid of my morning one!! Love this pillow. I have back issues but have had no issues with this pillow hurting my back either. Best product out there. I was sleeping better, more deeply. It took a couple of weeks for me to get used to, but I began to find I was sleeping better, more deeply. I wasn't sitting straight up in the middle of the night thinking I was going to vomit anymore and while I can't be 100% sure, I don't think I'm snoring quite as much. It was a little pricey but seems to be well worth it. Unfortunately, weekend naps seem to be a thing of the past. OMG!! I love this pillow!!! OMG!! Mine just arrived and I tried it out. It is everything I'd hoped it would be. I was nervous paying so much for a pillow, it it is worth every penny. Brilliant design. It gives your arm a place to be, which has always been a problem for me. It has gotten even worse since I've gotten older and gained weight. I love this pillow!!! Love mine!! Cannot go back to standard pillows!!!! I haven't slept this well in years. I've have had my pillow for a full week now. It's really expensive and I had my doubts but with the money back guarantee I figured I'd try. It takes up a lot of space in the bed but I haven't slept this well in years. It takes a day or two to get used to but I love mine. Definite improvement to my quality of life!! I'd like to give an update... I've owned this now for a month or so and my sleep gets better and better! My morning backaches are GONE!! My shoulder is MUCH less aggravated (I have tears in my shoulder, so it always hurts...) But I can't tell you enough how great this thing works. Seriously people, if you are considering this to help with neck, back, or shoulder pain at night - get this thing!!! It is amazingly comfortable!! And make sure to get that wraparound pillow, it is amazing in itself! And if you're a doubter, nobody asked me to write this and I definitely wasn't paid!! I use this pillow contraption thing and I love it and HIGHLY recommend it!! Definite improvement to my quality of life!! Worth every penny! I just bought mine � I have GERD, Carpal Tunnel both hands, groin pain, insomnia, sleep apnea, restless leg syndrome. So now everyone gets the idea and I love mine. I just ordered extra covers so I have an extra set. I takes a bit to get into the grove with it. Mine kept pinching my arm pit. But it's easily solved by scooting up the wedge a bit. I even showed my PCP. He said he'd never seen one so I was happy to fill him in. Next month I'm going to have a sleep study and I'm planning on bringing it. It's a little large for traveling but I just can't sleep with out it now. I can have bad GERD getting into bed and it will last for hours. But now I lay my head down and it stops within a minute. I no longer wake up choking! Thank you! I no longer wake up choking! I've battled GERD and a hiatal hernia for years. This has been wonderful, I can't sleep without it now. This product has been a God-send! I can not recommend it enough for acid reflux, shoulder problems, and congestion! This pillow system has allowed me to sleep in a bed for the first time in 3 years! Please make an inflatable version for travel! At first, I could not use the MedCline Reflux Relief System. the acid reflux was so extreme it was a problem even sitting up. I had to get some of it under control. Each night I get a bit more time sleeping in the bed because of this wonderful product. I am still having an issue on occasion with my arm going to sleep, but that may be another problem. I have worked around and figured out how to get comfortable. Thank you, it is very helpful. I still want to find the solution for the underlying issue, but in the meantime this is a lifesaver. A little bit of a background: I have problems with my neck and right shoulder, managing pain (some compressed vertebrae in my neck). Sometimes I also have to battle reflux. For the last couple of years I haven't been able to sleep on my back because my I start snoring very loudly, so I had to always sleep on my side, which had worsen my shoulder pain. I had spend a lot of money on pillows, trying to find at least a good one. I was also about to invest over $10,000 in an adjustable SleepNumber mattress system. Then, I came across MedCline add and decided to give this pillow a try before getting myself into a $10000 mattress. The first weekend I have the pillow, on the Saturday, I woke up at 10am for the first time in more than 10 years. Usually, pain would wake me up at no later than 7:30am. PROS: 1. Allows me to sleep with my vertebrae fully aligned, so I don't wake up with neck pain anymore. 2. Because of the arm pocket, my shoulder doesn't hurt anymore when I wake up. 3. I can sleep on my back and on my sides with no issue, perfectly aligned. 4. Absolutely no snoring, no matter my sleeping position. 5. In combination with a diet change, this pillow had helped me with reflux. Also, I can breathe better through my nose. CONS: 1. It tends to get warmer than other pillows I had used. 2. Sometimes I develop some pain on my ears, I guess the long pillow press against my ear. 3. It takes a few days to get used to it. In summary, I believe I found a very good pillow in medcline, which is solving significant issues with my sleep. Some may say it is expensive, but I found it a bargain when I compared with a $10,000 mattress system. It had worked so well for me, that I just ordered a second one for my wife. I would not hesitate to buy it again. Yes, this was an expensive product to try - but, I am very satisfied with the quality. I suffer from GERD and have been symptom free during sleep since using the MedCline. There was an adjustment period, of course, but the real surprise is the comfort. Because my GERD has not been well controlled with meds, diet changes, and weight loss - I had given up. But, this product has really given me the confidence to sleep with out the risk of an event. Previous to using the MedCline I was unable to let myself rest free of anxiety - I have had several sleep reflux events that were terrifying, so I am very excited about MedCline. When you pull out the pillow and toss it down on the bed to try it out, you are enveloped in a candy cane of comfort. (Not sure why candy cane striped pillow cases are not available yet). Putting your arm through will bring you instant relief knowing you will not spend the night tossing and turning from sore shoulders. At first, it feels a bit odd to have your hand out, but I find putting some of the blanket over it helps that oddly exposed feeling. Additionally, turning over was a bit of a challenge at first, but quickly (2-3 nights) overcome. Highly recommend getting the candy cane pillow in addition to the MedCline itself. It's like a hug from your bed. Only downside is the cuddling. If you puppy sleep with your significant other, the pillow presents a bit of a challenge. Shift around until you find a good compromise. Or maybe Medcline could consider making a couples pillow. Both my husband and I suffer from shoulder pain... It would be great to have one large version for both of us. I purchased this for relief from burning heartburn/sour stomach in the middle of the night. Not only did it wipe out this problem it also eliminated hip pain, my arm falling asleep and loud snoring. It took a little time to get used to it but I am so glad I did. In addition, shortly after it arrived I had to have emergency retinal surgery which required me to lay on my left side 55 minutes out of every hour. Without my Medcline I know I would not have been able to stay in position all night. Following doctor's orders so precisely allowed for faster healing. I was so grateful. It is bulky in the bed and to store during the day. I get up 2 or 3 times a night to use the washroom and re-positioning can be a bother. But the net result is well worth it. I wish they made an extra large system so my 6'6" husband could use one. No drugs, machines or invasive procedures is a dream come true. I love the whole system. I have longer than average arms. I purchased the largest medcline I could and my arms and shoulder didn't fit well inside the interior of the product. I tried several pillow configurations, the body pillow which is included in the kit (and which I incidentally love and am keeping) but after two weeks of trying things on and off I could not get a nights sleep using the incline system. I'm honestly at a loss as to what to tell you in terms of how to improve it. I'm sure it works for a large average majority of clients, but it didn't for me. I was a little hesitant because of the price, but now I feel it was absolutely worth every penny. This helps out more than raising the bed and I can finally wake up without heartburn. Great materials it's actually surprisingly dense and heavy foam but very comfortable. My only complaint is I wish the ramp was another inch longer so my hip made contact but i usually just try to sit up a bit higher and it does the job. Now if only I could travel with it somehow, but it's not portable so looks like I'll only get relief when I'm at home. I replaced the pile of 6 pillows with the full set up here, wedge, insert pillow and body pillow and I love it. Now more shoulder pain or numbness and reduced my back pain by 90%. I had an esophagectomy in February 2016, and have had a very difficult time sleeping ever since. Even my best nights have featured no more than 4-5 hours of solid sleep. I'm 5' tall, so had to wait for MedCline to launch their new 'small' system in February 2017. Because I had such high hopes for the product, I was quite skeptical when it arrived. To my delight, it was everything I needed it to be. I'm now able to sleep a pretty solid 7 hours. I'm feeling less and less as though I've been through a war in the night, and now actually look forward to going to sleep (I'd come to dread it until my Medcline system arrived). I highly recommend getting the entire system, which keeps me comfortably positioned properly. It took a few days to get use to it but now that I have I can't sleep without it. For off - don't let the price freak you out. It is well worth it. I received my sleep system last Wednesday. When I woke up after the first night I realized I slept the entire night without any issues. That was a wowser moment for me. I'm thankful that this has continued for an entire week. The system fits your body like a glove. No more sliding off the old fashioned pillow wedges! The research done to develop this got it right! Give it a try - you have nothing to lose with the 60 day guarantee! I found a steeper learning curve than expected, but the reflux relief is spot on. Still working out the best position for me but regardless of the minor discomfort the relief is more than worht it. I have taken myself off all gerd medicines. I have suffered from it for years. The MedCline pillow arrived a week ago and I cannot say enough! No more propping with several pillows! No more sliding down off those pillows! I love it and highly recommend it. It is also quality made. As a side sleeper the Medcline was a blessing. In just one week I've already noticed I'm sleeping better and without the usual soreness in my neck and shoulders. I highly recommend this for anyone who prefers to sleep on their side. I took myself off all GERD meds about six months ago. I have a very bad hiatal hernia and acid reflux. I have been propping pillows for years and have had much difficulty with acid reflux during the night. I just love my new MedCline pillow. I have had no reflux during the night since I started using it. I highly recommend it, it is worth every penny! It's been almost 2 weeks and my shoulder pain is going away! The body pillow is very comfortable and I am sleeping longer and sounder each night. I've been using it for almost 2 weeks. I feel it helps with my occasional acid reflux and I think over time it will help with my quiet reflux. I have not had any issues with my back or neck, as I feared I might. It is actually very comforting to hug the big snakelike pillow. All surfaces are very soft and nice to the touch. I started out on a Friday night as I knew I would struggle the first few nights. The first night I had trouble falling asleep and could only use it for about 2 hours. Over time I have built up to about 4 hours, but as soon as I need to get up to go to the bathroom I stop using it. It is too much trouble to get it repositioned. I must say it is really big! Like a Volkswagen in bed with us. I have to remove it to another room each morning to make the bed, so you need a place to store it during the day if you want a tidy bed. Getting into bed with it takes practice as you need to climb over it and get it positioned. It is very well made and seems very durable. I bought this pillow to relieve shoulder and arm pain after I saw the was it relieved pressure on the arm I sleep on, my left. It does that and more. My acid reflux is less now. I sleep longer because I don't have to turn over frequently from arm pain. It is comfortable. I use a "My Pillow" with this one. I can tuck my arm inside the hole as well as stretch it out. I can breath clearly when laying on my back now too. Great pillow. I love this pillow system. I have not had to use antacids or even OTC heartburn meds since using the pillow system. Love it. I don't have acid reflux. I bought this for shoulder and arm pain. It is wonderful! It even helped with the arthritis in my knees. It is like snuggling into a cocoon and I can see how it would problematic for couples (maybe they should make a couples version). I can now sleep with no pain anywhere! The removable covers are a bit thin and I wish they came in other colors. They should consider making more cover option available individually. But the covers are soft and plush. Very comfortable! My reflux is all gone, and my back and neck have never been better! Product delivers what was promised. Sleeping on a wedge is so very different from what I am used to. I have been using for two weeks now, I feel that it is helping with my acid reflux. I think as time goes on I will get more used to it. It has not helped to much with my neck being stiff when I get up in the morning, it may as time goes on. I got it to help with the acid reflux, I thought it might make my neck feel bettter. The product seems to work as advertised. i have experienced no reflux symptoms when I have slept on it. I have been able to sleep better without Zantac 150s (which I had come to simply call adult mints.) My main reason for not rating higher is that the thing is just too big. It does take up more than half of a queen. I generally sleep on a king though. The sheer size of the item prevents getting close to my wife at all: I'm 8-10 inches higher than she is, and the wedge is just too wide for her to snuggle up with me. It has helped my reflux symptoms but angered the wife. I do like the arm hole positioning and love the body pillow. All in all, not really a win for me and my wife. I've used the product for over 2 weeks. It's outstanding. My reflux is better now and my shoulder pain is almost nonexistent. So I was one 2xdaily 40mg PPI Nexium also tried Omeprazole. It failed to control my LPR and I am one of the lucky ones I also have heartburn with my LPR. It failed to control as well. Also I took Gaviscon after meals as well as Pepcid at night. No results for 4 months. Desperate and ready for surgery I decided to try this pillow on a road trip across the country no less with not ideal conditions, bumpy roads 6-8 hours in the car and not ideal roadside food, definitely not reflux friendly food. After 7 days I improved about 25% whereas before I had NO improvement. My voice is finally coming back, the lump in my throat went from tennisball size to golfball size in just a week under less than ideal conditions. I have to say Im very strict about using the pillow. Only on the left side and ALL night, not 3 hours, 6 hours, all night. I am determined to be cured !!! It is no problem at all sleeping all night with it and I regularly go 8 to even 10 hours. I switch arm positions and leg positions, the body pillow is key to last 6+ hours. Which for LPR is a must no half way solutions here if you want to cure this sticky disease !!! I'm only on day 9 and every single day Im clawing my way back to life ! Around the end of last year I developed a case of GERD, and sleeping was naturally very difficult and that prompted my search for adequate pillows to help me raise my upper body at night. Due to the nature of what this is all about it's very nice to have a product that has been tested clinically and not just another wedge pillow. I'm a bigger guy, so my arm feels somewhat funny in the arm hole, but its worth it and it doesn't bother me once asleep. I haven't experienced any symptoms while sleeping with this pillow set up. I highly recommend it for anyone struggling with acid reflux. 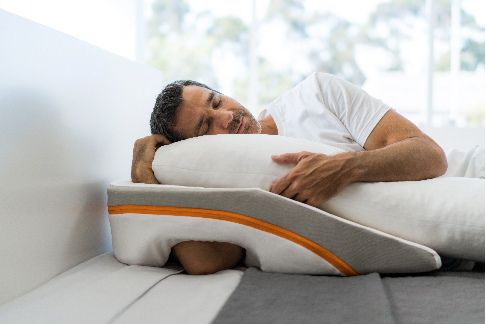 The pillow is expensive, but honestly there is nothing else like it and the price seems minimal relative to the risks and battles with reflux while you are trying to sleep. Thanks to the team at Medcline for putting their heads together to make such a unique and efficient product. After fighting with other wedges and constantly sliding down during the night, this has become a real savior! I suffer from GERD and Barretts Esophogus. I am finally getting a full nights rest without burning and coughing. Thank You!! Wasn't sure but love it! Have changed my eating habits, increased water intake but was still having reflux issues. Purchased the MedCline and I no longer snore, no longer wake up with fire in my throat and feel rested. It does take a good two weeks to get use to sleeping with this system but once you do it's very comfortable. After Hiatel hernia surgery, had trouble sleeping because of reflux. Saw this and it looked doable. LOVE IT! Now sleep thru the night without any reflux. Thank YOU! No more night time acid reflux. It's taken a little while to get used to mainly because I didn't normally sleep on my left side. You can sleep on either side with this device but the left is much more effective. After using it for about a week now I have not had to take Tums or other indigestion medicine before bed or during the night. It's a little weird to get used to sleeping on the wedge with your arm down underneath though. Sometimes I wake up on my back but it still seems to be working! It's ok, but jury is still out. I've used the product with and without the pillow. I've had trouble adjusting to the arm hole as it's a little uncomfortable for me, however I find when I move the Medcline a few inches off of the headboard I'm able to get a better sleeping position. I have mixed reviews about the pillow and actually wish I would had purchased the Medcline without it at first, as i can get the same results with my own pillows. I will continue to use the Medcline for a couple more weeks to see how it goes. As for the control of the reflux, that's the goal and so far so good. I'd just love to get some quality sleep too. I have acid reflux as well as neck and shoulder pain and have used multiple "bed wedges" that have the slide down issue, that actually cause neck soreness and stiffness, so when I saw this wedge I had to give it a try with the body pillow. It has surpassed my expectations for comfort and support and the neck and shoulder stiffness has diminished! As for the acid reflux, I sleep on my RIGHT side for relief (the direction the stomach drains)...sleeping on my left side exacerbates the reflux. My biggest complaint (and why 4 stars) would be the strong gassing-off odor of the construction material. My solution was to drape pillow covers over it, which helped diminish the odor. Even though it says it is not meant to be used all night, I have been sleeping on it for 8 hours, but wake up to get my arm out and repositioned to turn over...so far so good. I happened to see a Medcline ad on Facebook and as one who needs inclined sleeping I was intrigued by the unique design. Ordered it and got the pillow too. Very glad I did. The system is helpful and worth the investment. I decided to try the MedCline after being diagnosed with Barrett's esophagus. I didn't want to take medication. MedCline offers a fantastic trial period too! This product does everything it claims and more. I have no reflux issues at night and it is so comfortable! I'm sleeping better than ever. Thank you MedCline!! The MedCline pillow arrived 5 weeks ago and my heartburn issues have decreased to the point I do not need medication anymore. The Ear, Nose and Throat doctor told me my hoarse voice was due to acid reflux. He suggested an incline pillow, and I found MedCline. I now have my voice back! I have also noticed my posture when sleeping is much better and pain I have had in my neck is also gone. Thanks MedCline! My daughter is able to use the pillow only about 3 hours a night. We're looking forward to the xs size coming out soon. She's had surgery 3x and already feels better with the minimal usage of the pillows. I wasn't sure this product would work, but figured I could send it back if necessary. I love it! Have been sleeping soundly, without the anxiety and restlessness caused by reflux at night. The body pillow is cozy, and the wedge is very clever and comfortable. Thank you for coming up with this! My wife doesn't complain about my snoring any more ...I have sleep apnea & been using a CPAP for about 5 years (off & on) and I feel as rested as when I used it & feel like I sleep better. I also have acid reflux which will hopefully go away soon. I have acid reflux which evolvs to a horrible cough (all day too). The acid tickles my throat and it takes a lot of hard coughing to clear it. Since using ths system my cough has subsided. I am thankful someone came up with this idea! I had previously used a foam wedge which was useless as I would just slide down. Be patient getting used to the Med Cline -it will be worth it. And to top it off the customer service is top notch. I love my pillow. Can't live without it. The wedge helps greatly with my acid reflux and respiratory issues, and the body pillow is incredibly comfortable. I am sleeping so much better. I have told many people I know and my doctors about it, too. Also terrific customer service. I got the medcline system and i hope to use it soon but for now I am airing it out and washing the covers. I am sensitive to odors and it has a strong chemical smell that actually stayed on my bedclothes. Other than that I am eager to try it as my other option was to tilt my entire bed. I was skeptical but comfort and efficacy is undeniable. Well designed product and excellent customer service. It took me awhile to get used to it but my acid is under control! I used to wake up several times a night. I haven't since I bought it! I would recommend this product. As a result of several surgical procedures as a child, I have been managing acid reflux for over 40 years. I have tried countless medications and ever-evolving environmental changes, and nothing has performed like the MedCline wedge. This product has changed my life!! Give it a try, it will likely have the same result for you. This is an amazing pillow. There are so many ways to arrange it. The best thing is that I haven't had an reflux since I've been using it. The bad things are that it is so big that it is difficult to move it around and it looks a bit strange on the bed. My husband just hates it because it is so big and takes up so much room. It also isolates me "up on my wall". He really wants me to get rid of it but I plan on using it for the rest of my life. It also needs some reasonable pillow cases because it is white and gets dirty as usual. The zippered casing is very nice but difficult to change. Also the foam insides will gradually move down the "leg" of the pillow which is a bit difficult to get it back up to where you want it. I really like my new Medcline wedge. I sleep very comfortably upon it! I was sleeping in a recliner for months bc i couldnt sleep flat in my bed. I found this finally and have been sleeping back in my room. Its really comfortable! Seriously. Life changer. As a Mom who has a child with a hiatal hernia I tried everything to comfort my son's sleep at night. After the first night of him sleeping with the Medcline pillow system he woke up well rested. His first words to me that morning was "that pillow put me in a Coma. I slept so good" I also noticed he got to sleep faster with greater comfort. The quality of this product is also superior! We give it a definite two thumbs up! **Note from MedCline: Please contact our office prior to purchasing for a child to ensure they are properly sized. I am a skeptical person. With that being said, this product is comfortable. Before I would wake up during the night because of the acid coming up. Since I've had this I have slept through out the night. I feel a whole lot better. While I do occasionally suffer from acid reflux during the night, the main reason I purchased the MedCline was to alleviate my shoulder pain. And let me tell you, I picked a winner! From the first night, I have not had acid reflux or shoulder pain! I highly recommend the MedCline™ Reflux Relief System. I love this pillow system. It took me a could of nights to decide whether I was gong to keep or return this. But then I realized how much better I am sleeping and without my nighttime stomach meds. We have a queen bed, and my husband is also sleeping well. The system is helping my nightly acid reflux, however, I may need the the smaller sized product based on on my height. My height was right between the two different sized options offered. I chose the large size. My arm falls asleep and I have a hard time getting comfortable with my arm inside the product's arm insert. I may need to get the smaller size wedge and pillow for a better fit. I am debating but don't know if the company can replace my current sized wedge with the smaller version or offer any recommendations. However, overall, the product is helping with my acid reflux issues at night while sleeping. My throat has been relieved from the discomfort the acid reflux has been causing and has stopped my esophagus constriction pains during the day. It's helping me! We recently bought two MedCline pillow systems for our home! My husband and I are both in love with them! We were both having terrible acid reflux that would even come up on us at night. We would wake up coughing! Now we sleep like babies through the night! They are well worth the money! Thank you so much! The wedge is a far more useful product than the body pillow so far. That said, the wedge has been terrific, and I have seldom slept so well. I find the body pillow to be a little cumbersome and its fabric too warm, so I have sometimes used my regular pillow atop the wedge with good results. Either way, my sleep is markedly improved. This has helped my girlfriend immensely. The slope and height of the wedge is good and the cut out to slip your arm through makes using it comfortable. The wedge & body pillow do take up quite a bit of room - luckily we have a king size bed. As a bonus, while this was purchased to help with my silent reflux, I think it might also be helping to decrease my snoring. Not sure how the white color will hold up over time - afraid it will look dingy after awhile. While at National Jewish Hospital in Denver This last month, I was diagnosed with Silent Reflux that had taken another piece of my lungs in just this last year. The Dr.'s insisted that a life style change could help prevent further damage. Nutrition and sleeping habits being two of the controllable traits of this issue. The Dr's recommended sleeping at a 30 - 40 degree angle. When I checked into the options, it seemed there were just two; adjustable beds or piling up pillows. Adjustable beds were between $3000- $5000. Wedge pillows seemed to have issues with staying in place and sliding around. My husband and I like to travel with our RV and so we wanted something we could use at home and take with us on the road. My nutritionist said she'd heard of Medcline but didn't know of anyone using it but encouraged me to "check it out". I did. It seemed that it was just what I needed. I ordered the large thinking that because I am somewhat long legged and was right between the large and small, the large would work. To my dismay, the large was just a little too large and I kept slipping down and it seemed to hurt my hips. My husband called Medcline and they had me measure from my hip to my arm pit. They said I needed the small and they shipped it out right away. Two days later it was at our door. I love it. It's comfortable, easy to use and sleep with. I'm still getting used to moving around and trying to adjust to just sleeping on my left side. Every position is comfortable. I would recommend this over anything else on the market. I have tried several other methods to raise the my head higher due to gerd. None were helpful or comfortable and I gave up. I have been using the Medcline for one week. I find the memory foam comfortable and absolutely love the candy cane pillow. I find I can only sleep about an hour or two and then I am very uncomfortable mainly in the hip area. I think the angle of the Medcline puts more pressure on my hips. I am currently looking for a nice bed topper to help me be more comfortable. I am really hopeful that the combo of the Medcline and bed topper will fit the bill. The pillow is effective for relieving acid reflux. It is well made and comfortable but very big. I don't use the "snake" pillow although it would be comfortable but I sleep with my husband and it doesn't encourage closeness. This is a nice pillow for acid reflux. It takes a little time to get use to sleeping on it, as I trained myself to sleep mostly on my back, so I could use the triangle wedge or sleep on a recliner chair. (I kept sliding down off the bottom with both, but it was better than a sore throat.) It has been three weeks and I am getting better and better at using it. I was in hopes this would work for me, but I didnt even want to think about going to bed after I installed it because it became such a hassle to try to attain the correct position. Wish I found this years ago! I have had serious and damaging refux for a long time, but I always slid down when I was sleeping from my multiple pillows and wedge. With this system, I stay planted higher up on the wedge with the comfortable body pillow "anchoring" me. My sleep doctor advised that I sleep with a wedge and also use a device to keep me from rolling on my back at night—at that time I was not using my C Pap machine—thought it was aggravating my sore throat). Within two weeks of starting to sleep with the body pillow and positioning wedge together, the continual raw sore throat that I had been experiencing went away. Although the pillow was very comfortable, I did have problems using my (C Pap) face mask with the body pillow and wedge together and needed to return it. Now that I'm using my c Pap machine every night and sleeping on the Wedge with my own pillow, my throat feels good, I'm sleeping comfortably on my left side without rolling to my back, and I'm not experiencing any buildup of mucous in my throat during the night like I had been when I was sleeping flat in bed. I highly recommend the Medicine products. I have fought the pain and sometimes agony of severe heartburn for at least 10 years. It was under control with Nexium but after reading the long term effects of proton pump inhibitors I knew I had to find another solution. I've been able to reduce the medication by 50% and plan to wean myself off of it totally within the next several months. I just need to be cognizant not to spur another bout with Barrett's esophagus. I have enjoyed such improved sleep since I started using the sleep system and couldn't be more pleased! I have tried other wedges, but they do not compare to this. Very comfortable and good quality. For side sleeping, I found the memory foam too firm...especially around the breast area (for females). But it is great pressure protection from a painful shoulder. And the body pillow is body pillow is wonderful. DO not order by your weight...stick to your height. I would give 5 stars except the foam moves to the ends of the body pillow. Find some way to keep the body pillow even without having to "shake" the stuffing back in place every night & I'll give it 5++++ stars. Was kind of skeptical, but after several days of using the pillow I love it. I feel that it has definitely helped with my Acid Reflux. Great, innovative solution for Acid Reflux! I'm extremely happy that I found MedCline's wedge pillow system to address my acid reflux issues. I've had the product for about three weeks and I've had no problems with acid reflux since using it. It does take a few days to get used to it and find the optimal position for a restful sleep. The pillow is extremely comfortable and gives good support to avoid sliding down. I bought one for my son-in-law too as he has suffered from acid reflux for many years. I'm considering getting another one for our vacation home. Reflux has met it's match! I have had multiple surgeries for hiatal hernia. Once even ended up on a feeding tube for 3 months. I've had severe reflux and had tried everything from sleeping in recliners to not sleeping at all for fear of a reflux attack. My doctor had said that my condition was for life due to the issues with my hiatal hernia/esophagus. Medicine didn't really help as my problem is m"mechanical" as my doctor put it. If I got off of the pillows or wedge at all, here it came. I bought the Medcline against my doctor's recommendation actually, because he had never heard of it. He thought it was probably a gimmick when he saw the price. Believe me, it is the real deal. I have not had one reflux incident since sleeping on the Medcline system. I did travel one night without it and guess what? Yup, my old buddy reflux was there to greet me! I won't leave home without it again! I intend to tell my doctor all about it when I see him again. By the way, he is one of the best thoracic surgeons in the country. Thanks Medcline. I am sleeping better and are more upright but also shoulders and back feel better. Original review posted on Amazon. I purchased directly from Medcline. I use only the Wedge for afternoon naps, and the full system for night sleeping. At night, the most comfortable restful sleeps I have ever had. The body pillow wraps me in a cocoon like setting. Incredible comfort. My arm slides easily under both the right and/or left opening. I usually sleep on the same side, and my arm usually stays in place all night. I also find it comfortable to sometimes fall asleep on my back. Because of the comfort factor, I use it all the time, and my reflux issues are no longer active at night. I'm a senior, have had Barret's esophagus for 12 years, and have been on medication the entire time. I'll probably never go off medication but at least I'm enjoying my sleep as never before. My wife prefers I sleep on the guest bed, which is a twin, with this somewhat large device. Our main bed is a queen. If your spouse isn't picky, you can easily use it on a king size bed, with your spouse beside you. If you don't spring for the full system, the wedge itself is great. I have had LPR and hiatal hernia, for at least 15 years. None of the meds work for me (except Gaviscon Advance liquid from England). I had tried to keep head of bed raised, and like a lot of folks ended up at the bottom. I purchased a wonderful bed on a slat system, and bought a Reflux wedge from them, which I then had about 6 pillows both around me and under me. I thought I would try a change on this because my reflux has been getting worse at night, and this design looked very original. I've only had it for one week, so not sure how much its changed my reflux yet. I think that I am having less throat clearing during day. I found the wedge part of the pillow hard to stay up on, find myself slipping down during night. Sometimes my neck/shoulder and oddly my hip hurts. That being said, I love the body pillow, its amazing. It sort of holds you in a comforting embrace, and will move however you need it. I am happy with my purchase, and will continue to sleep on it. My husband has shoulder pain in bed, and may end up getting his own system. Received the medCline in 4 or 5 days after ordering. I thought that was good delivery time. Easy to setup and very comfortable. I already notice my reflux is doing better than my laying flat. The materials are high quality memory foam. The one drawback is you can get hot during the night with pillows being utilized. But I just slept with less covers. Relief from reflux AND shoulder pain. I've tried other wedge pillow products and they always disappointed me. I would wake to find that I slid off the bottom of the pillow or it just wasn't comfortable for a side sleeper like myself. The design of this one is such that your arms slip through the pillow and you actually are holding it in place as you sleep. No more sleigh riding down the wedge to find myself lying flat during the night. Although its designed for aiding acid reflux issues (which it does) it is also very comfortable if you're dealing with shoulder pain when you sleep. The 'J' pillow is very nice. Having been sleeping with half a dozen pillows propped around me; this product is great. While at National Jewish Health I stumbled across a brochure promoting a portable reclining solution for reflux and Gerd issues. It's recommended I purchase a reclining bed to manage my gerd and reflux issues to deter Mycobacteia infections in my lungs. As an alternative to purchasing a costly reclining bed this is a product while to consider. I'm very satisfied with this wedge. It keeps my shoulder and arm relaxed. Noticeable improvement in my nighttime reflux. I might consider adding velcro to keep the body pillow locked in place, but otherwise this is the absolute best product out there. I have been using my medcline for about one year. I have had the diagnosis of Barrett's for 3 years prior to using the pillow. No medication or weight loss seemed to be able to control my GERD. However, I noticed after about one month of using the pillow that my GERD was significantly better. I now rarely if ever have any issues with it. The best news is that I am now Barrett's free (endoscopy biopsy results) after using the pillow! I really encourage anyone with GERD to try this system. It works! My thanks to the researchers for developing a drug free way to live a much healthier life. I have had reflux for a long time. This product is superior in every way to the typical wedge. I was surprised how well I sleep. I still had occasional heartburn but It seems to be improving. I would buy again. This system really helped my reflux. It would be awesome for me but when I put my left arm through the hole in the side, my shoulder would hurt and would be very sore in the mornings. It just did not fit me right no matter how hard I tried to make it work. This was very disappointing as I feel it is a good product and I really wanted to be able to use it. Genna in Customer Service was very helpful in giving me some ideas to help it work, but it still was uncomfortable for me. I regret having to return it, but felt I had no other option. I appreciate MedCline being so helpful and being willing to take it back. I have had my MedCline for a week and I can't praise it enough. I have suffered from nighttime reflux for decades. I had just gotten used to waking up 2 or 3 times a night to take antacids. I also suffer from insomnia and have always been a VERY restless sleeper. I was skeptical about sleeping in one position for any length of time. Imagine my joy (and amazement) when I slept an entire night in one position WITHOUT waking up! The angle is perfect; my entire spine feels supported. The hole for the downside arm is genius. The candy cane body pillow is the most comfortable pillow I've ever had. I realize my restlessness has been a chicken/egg thing. I think I was restless because I could never get comfortable; when I'm truly comfortable there's no need to fuss about. I don't think I understood how seriously my reflux and constant tossing and turning was ruining my quality of sleep. It was a chunk of change, but I feel it was worth every penny. The completeness of its approach cannot be overestimated. After only a week, I honestly cannot imagine sleeping without it. Medcline pillow system allows me to sleep comfortably in any position on my back, on either side, left side, right side all while staying in position without moving around. Keeping acid in my stomach and out of my esophagus. Very satisfied with this product. First I have to say how comfortable and cozy this pillow system is. I purchased the pillow to help with facial swelling that forces me to have to sleep inclined many nights of the week. I had a traditional pillow wedge but could never get comfortable on it and was desperate to sleep flat after bad nights of sleep... this MedCline pillow system has made a huge difference I am very pleased I am able to sleep upright comfortably. I highly recommend for anyone who needs to sleep inclined, this pillow system is wonderful. Helps prevent reflux. Very comfortable. A little cumbersome to deal with. This system has not only helped with acid reflux but also with sinus issues due to the elevation. It is the most comfortable wedge I have tried, and the plus is I have no back pain as with other wedge pillows. I sometimes use the pillow that comes with it and sometimes substitute my own pillow on top. I am very pleased! I've struggled with severe reflux for decades and was diagnosed with GERD and Barrett's esophagus six years ago. I had gallbladder surgery two years ago, which dramatically increased my nighttime reflux. I take Omeprazole (40mg) twice daily and have high-dose Ranitidine (300mg) for use at night. I've avoided eating or drinking anything after 7pm for years, and would wake up to the taste of reflux every day. I've tried wedges, pillows, raised beds, diets and everything else I could think of. Then I found Medcline. When I sleep on my MedCline pillow, I never need Ranitidine and I never wake up to the taste of reflux. I'm even able to have a drink or light snack immediately before going to bed. I will be talking to my doctor about reducing my Omeprazole dosage too. Medcline has literally changed my life. If you have reflux, you have to try it. It's worth every penny. Many more sleeping options now! I have acid reflux at night. What a pain in the neck. I have slept on the large pillows I ordered from medcline for 4 nights now. I have not woke up with my neck in a horrible position in the last 4 nights. No more propping up my upper body with a million pillows. Which never stay where you want them. I have wide shoulders and always sleep on my sides. I've noticed my arms are not falling asleep from cutting off circulation now that my arms go thru pillow. Really neat idea. And o ya did I say I have acid reflux. It is not a chore to lay down on my bed anymore and position pillows all over the place. It keeps me positioned for the majority of the night. I got used to the system the second night. Really fast. I would buy it again and look forward to going to bed now. It took a couple of nights to get used to the new sleeping position but after that it's been a pleasure! It truly provides the unique positioning required to be comfortable on your side with your elbow tucked between the wedge and pillow. I had an esophagectomy 6 years ago and have had consistent challenges sleeping on a wedge. Reflux, aspiration of stomach acids, chronic neck pain. Using it for 5 nights, the change is dramatic. Extremely comfortable, with firm support and positioning. No sliding down, and my neck pain has dissipated. I wish I found this 6 years ago. MedCline would have given me years of comfortable sleep and avoidance of the issues I've had to deal with. Well worth the price! About 5 weeks ago, I purchased this system for my wife, who has severe reflux. She would awaken at least twice a night with a severe reflux attack. Since she has it, she sleeps far better and only once has awakened during the night with reflux. She loves the MedCline - Reflux Relief System. I am an night shift nurse who has very severe GERD for the past decade. I am so fanatical about getting this condition under control, that I've read the Yamada's Textbook of Gastroenterology, 2 Volume Set, 6th edition. I've followed every direction with limited success. I am also on Prilosec, but have tried Nexium, Dexilant, AcipHex, Protonix, and all of the H1/H2 variants. I've owned MedCline version 1, version 2, and now version 3. I can tell you without hesitation or doubt that this is the finest pillow (GERD or not) I have ever used. The product really represents the pinnacle of innovation, the finest materials, and design. The fact that there are multiple revisions of the product just proves that the company listens to customer feedback. To illustrate my experience, I have owned 13 GERD pillows and although this one is the most expensive of the group, it is unquestionably the best by a gargantuan margin. The rest of them were trashed or donated to Good Will. I hesitate to call it pillow. They call it "system" for a reason. It hugs every inch, every nook, every contour of your body to make you feel like you're sleeping on clouds. I could not stand any of the other GERD solutions, much less sleep on them. There's that popular saying that most of you know... "you get what you pay for" and while the MedCline may seem expensive, it is worth every penny! Please support this company and try out their product. The only vested interest I have to make sure this company grows and continues is research/product revisions for people like us who suffer from horrific GERD. Some side notes: 1. The pillow also gives you a cognitive benefit in that it makes you WANT to go to bed and fall asleep on this pillow. 2. From a non-GERD perspective, It's so comfortable that my wife is actually using my 'older' version (even though she doesn't suffer from GERD)! Bottom line - if you want the best, then go ahead and order it. I got this pillow system for my reflux and it has helped dramatically. I have LPR ("silent reflux") symptoms mostly and at night suffer from a dry mouth whilst sleeping, presumably from acid refluxing up the esophagus. This system while a bit bulky is incredibly comfortable and revolutionary. It feels like you are sleeping on a cloud. The pillows are very high quality. Being a side sleeper with shoulder problems, I find that it takes all the weight off your shoulder and arm which is an added benefit. This pillow system also seems to support your whole body. Would highly recommend this system to anyone that has chronic reflux issues. Very satisfied!!! I have tried many things for reflux and allergies that get worse overnight. I read lots of reviews about this system before making the purchase. I LOVE IT! It is sooo comfy and soft and snuggles you all night. I can't wait to go to bed now. Its worth every penny! Thanks Amenity Health! The pillow is great. It has definitely helped my reflux. It feels a little confining at first but once you get used to it you are comfortable. I often only use it for half of the night and then switch to my regular pillow. My husband likes it since we no longer have to have the bed elevated. I would buy it again. This is the best product I have tried for nighttime reflux. I was diagnosed with Barrett's Esophagus. This pillow system is remarkable and I have had one for almost 3 years. My last check up said no more Barrett's. I have had GERD most of my adult life, and I'm in my 50s. I now have a disease that requires me to take two prescription drugs plus supplements for GERD, for the rest of my life. I want to be less dependent on meds, so I asked my gastroenterologist to prescribe MedCline. And it works wonders. I tried a standard wedge which was too uncomfortable for a side sleeper. And the meds don't work 100% of the time. But the MedCline system allows me to sleep comfortably through the night while controlling my acid reflux. I no longer wake up with that burning feeling in my throat and chest. My esophageal sphincter doesn't work correctly, and the MedCline system prevents stomach acid from coming up through my esophagus and damaging my heart and lungs. I highly recommend MedCline for anyone with GERD or chronic heartburn. It works way better than a standard wedge or raising the head of your bed, on blocks. I'm hoping to wean myself off of nighttime meds (PPIs) because long term use causes osteoporosis. Looking for shoulder relief only? If you DO NOT have acid reflux or GERD, our new Shoulder Relief product will be better for you! 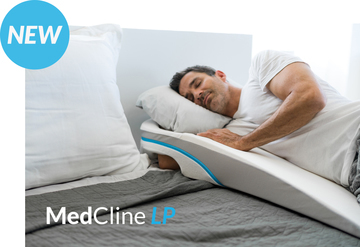 The MedCline LP Shoulder Relief Solution is a new device designed for the ultimate in side-sleeping comfort. Unlike the original MedCline, MedCline LP creates a gradual 5-8 degree angle, which will prop you up just high enough to take the pressure off your arm and shoulder. Click the button for more details. Therapeutic Body Pillow, included in the System, is very important for effective relief. While designed specifically for nighttime reflux, many customers report that the Reflux Relief System is also helpful for positional sleep apnea/snoring. The addition of the Therapeutic Body Pillow is key as it keeps you from rolling to your back. The Advanced Positioning Wedge (without the body pillow) is not nearly as effective and the Body Pillow adds comfort too. Purchase the System today! Need help choosing your size? Your experience is highly dependent on getting the proper size. Our sizing chart is our best recommendation based primarily on height. However, individual body types may dictate otherwise. Torso length and personal preference are also factors. If you are in-between sizes, we recommend choosing the smaller option. Weight is secondary to how the wedge fits from the hips to the armpit, but may need to be taken into consideration. Are you still wondering what size is right for you? Please call one of our sleep specialists today by calling 1-800-610-1607. © AMENITY HEALTH, INC. ALL RIGHTS RESERVED.